Volkswagen is one of the highly acclaimed passenger car manufacturer from Germany and it has produced some magnificent car models. Volkswagen Vento is one such sedan model from its portfolio, which is made available in both petrol and diesel variants. The Volkswagen Vento Petrol Highline AT is the top end petrol variant and it is equipped with a 1.6-litre in-line petrol engine. The engine powering this particular variant is capable of producing 1598cc displacement capacity that allows it to unleash a superior power and commanding torque. This engine is learned to have the ability to deliver a peak mileage of about 15 Kmpl, which is good considering its engine power and vehicle stature. The exterior design and structure of this sedan is one of it's highlights and it will certainly catches the eyes and turns the heads. The company built this sedan with a class leading body fit and finish that gives it a premium sedan look. Also there is a lot of chrome treatment on its body, which will further add to the appeal of this sedan. The interior cabin section of this car comes with top class design and environment that will certainly offer a luxurious feel to all the occupants. Coming to the style and appearance, this Volkswagen Vento Petrol Highline AT variant looks very aggressive yet very decent with a lot of chrome accentuation on its body. On its front facade, the radiator grille comes equipped with horizontal chrome slats along with a chrome plated company logo. This radiator grille is surrounded by the black finished aggressive design headlight cluster that is powered by halogen lamps and turn indicators. Below the radiator grille, there is a stylish and sporty design bumper that comes incorporated with an air dam and fog lights. The company has given the chrome surround to these fog lights, which will further add to the looks of front profile. The side profile of this sedan is very decent with expressive lines on its body giving it an appealing look. The well molded wheel arches have been skillfully fitted with the alloy wheels that gives an added attraction to the side. The door handles and the ORVMs have been painted in body color where as the window sills have been garnished in gloss black finish. The bumper at the rear profile looks pretty decent but the boot lid and the taillight cluster adds a distinct look to the rear. The company logo, variant and model badging gets the chrome treatment, which will compliment the overall look of this sedan. When it comes to the interior cabin section, the Volkswagen Vento Petrol Highline AT trim has a magnificent interior design that gives a pleasant feel to the eyes. As a result of using high quality scratch resistance plastic materials, the company has managed to obtain a close finish inside the cabin. The gearshift knob and the multifunction steering wheel inside the cabin that has been wrapped with premium leather upholstery. The seats fitted inside the cabin have been covered with leatherette material that gives a luxurious feel to the occupants. In the front cabin, the dashboard looks very elegant and it has been equipped with several advanced equipments as well as functions. The company blessed this particular variant with some of the exciting features such as storage compartment in front doors, 3 grab handles above doors, folding with coat hooks, cup holders, bottle holders, glove box compartment, leather wrapped steering wheel, front and rear center arm rest, and lots of others. All these features will add to the customer excitement and pays complete value for the money. The Volkswagen Vento Petrol Highline AT top end petrol variant is being offered with a 4-cylinder, DOHC based 1.6-litre, In-line, powerful petrol mill that can produce 1598cc displacement capacity . This engine can unleash a maximum 103.56bhp of power output at 5250rpm and at the same time it can generate a peak 153Nm of maximum torque output at 3800rpm. The front wheels of this sedan draw the commanding torque power generated by the engine through a 6-speed automatic transmission gearbox. This automatic gearbox further enhances the smoothness of the engine and allows it to deliver top rated performance. According to the company this, engine coupled to the 6-speed automatic gearbox has the ability to give away 15 Kmpl of maximum mileage , which is decent. This premium sedan has been gifted with robust braking and handling aspects. Handling this vehicle is utmost simple as the speed related electronic power steering system requires fewer efforts from the driver to steer the vehicle even at low speed levels. In addition to this, its robust suspension system contributes for the enhancement of vehicle’s stability and its agility. Its front axle comes fitted with the assembled with the McPherson Strut type of suspension system whereas its rear axle has been equipped with the semi-independent trailing arm type of suspension mechanism. As far as the braking system is concerned, the front wheels are fitted with the disc brakes while the rear wheels have been drum brakes. These disc and drum brakes are very efficient and its efficiency is further enhanced by the anti-lock braking system, which helps the driver to enjoy a skid free driving experience. This high end trim comes with some of the most exciting comfort features. Some of those significant features include a speed-related electronic power steering, driver's seat height adjustment, front and rear power windows, air conditioner system with dust and pollen filter along with rear AC vents, front intermittent wiper, electric trunk opening, rear defogger, stylish instrument cluster, and so on. Apart from all these, the German automaker is also offering some of the sophisticated functions such as a 2-DIN, RCD 320 audio player with USB, AUX-In and SD-Card slots, central locking system, reverse parking sensor and other advanced features. Coming to the safety and protective aspects, this particular top end variant comes with highly sophisticated that assures the safety for the car and to the passengers. The list of features including dual air bags, anti lock braking system, pinch guard safety for all 4 power windows, high mount third brake light, front and rear fog lights, an engine immobilizer system with floating code and lots of others. Pros : Handling and driving experience is impressive, good comfort features. Cons : Poor mileage, price can be competitive. 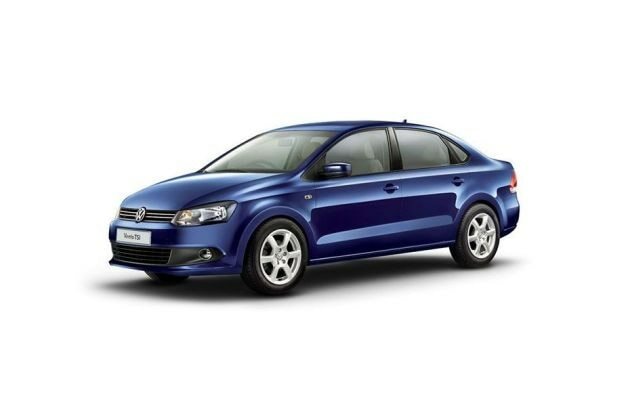 Volkswagen Vento 2010-2013 is available in 6 different colours - Pepper Grey, Reflex Silver, Candy White, Deep black, Shadow Blue Metallic, Terra Beige Metallic.